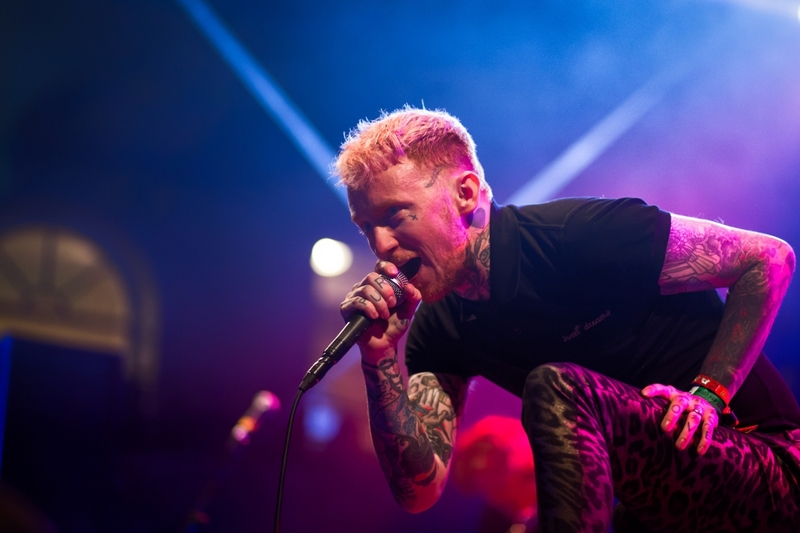 As Frank Carter and the Rattlesnakes prepare for a sold out tour and a new album Getintothis’ Peter Goodbody had the chance to have a chat with the main man. Frank Carter is in bouyant mood. His band has a new album – End of Suffering – about to be released and a tour that sold out its UK dates within moments of being announced. We first encountered him at Rebellion in 2017 where we were completely blown away, although quite why he’d not appeared on our radar before then is still something of a mystery. No matter, that’s been redressed. With his band The Rattlesnakes he pushes out some of the most powerful, angry and yet, at times melancholic music there is around at the moment. He’s known for stints fronting Gallows and Pure Love, but it’s in the current incarnation of the Rattlesnakes that Frank seems to have found a voice which has grabbed fans around the country as well as the rest of Europe. In advance of the new album and the tour we were keen to have a quick chat and see what makes him tick. Getintothis: Where are you right now? Getintothis: You’ve got an album coming out and a tour coming up – the new album called End of Suffering, that sounds like quite a dark title in a way, but in a sense looking forward as well. Where do you see it fitting? Getintothis: How do you think it compares with the previous two albums? Getintothis: Cool, we’re looking forward to hearing it. Getintothis: You’ve talked previously about mental health issues and you talked about Modern Ruin [the previous album]as dealing with those kinds of issues and the admission that people are not OK. Is there anything of that in End of Suffering? FC: “It’s fully about that. Modern Ruin was literally about ruin. About the decisions that happen, the thoughts that occur and are a constant negative place and how it’s so difficult to break from that negative cycle. And that ends up turning your life into ruin. End of Suffering is about the ups and downs that happen naturally through life, the good times and the bad times, the moments of beauty that are hidden amongst the chaos. And also the moments of trauma and tragedy that are hidden along there as well. Getintothis: When we google the band, you’re always described as a punk band. Is that an easy pigeon hole, or is that how you see yourselves? FC: “I think it’s an easy pigeon hole, to be honest. If people ask me what I do now, I say I play in a rock band. Because rock is a wider genre and it’s always been like the main muse for a lot of other genres – when they’re stuck, they turn to rock to borrow a riff, or borrow a leather jacket, or borrow a stage dive, you know. That helps them push their genre through. I think real rock music is the most condensed form of emotion and that’s why I’ve always loved it. Getintothis: You’re going out on tour soon and playing some pretty small venues; you could easily have been playing much bigger ones. What’s the thinking behind that? FC: “It’s fun innit? It’d be really fun to go and so small shows. I’m hard to work with, but it’s for us, it was important that this next tour was a little more intimate than how we ended up in the UK – we’re going to be playing some new songs and I just always believe the right place for new songs is smaller venues where you can really cut your teeth and you can see the emotion from people and feel the energy and the atmosphere – you can’t escape from it.And it also doesn’t get lost in some of these cavernous venues. Getintothis: Are you still going to do that trick where you walk out onto the hands and shoulders of the audiences? Getintothis: We shall look forward to seeing that. Getintothis: Has the band got any plans once the album’s out and the tour’s finished? FC: “Touring. Relentlessly, all summer. We’re doing as many big festivals as we can. It’s a beautiful opportunity to play some really big shows with some amazing bands. So, I can’t say now, but they’ll get announced in due course. We’re all really, really looking forward to that. For us it’s just about playing as much as we can and putting our new songs back out into the world. And taking the time to enjoy the fact the album is completed. The first stage happens when you’re writing it, the second stage happens when you’re recording it and then the third part, which is the acceptance and the celebration – that happens every night when you get to play those songs out to people and that’s where their therapy with the songs starts. And that’s a beautiful experience. That’s what we’re most looking forward to. Touring as much as possible”. Getintothis: What bands are you listening to at the moment? FC: “We’re listening to Black Futures. I was listening to a band called The Pale Hearts the other day. We’re listening to a young rapper called Bexey, who does really interesting things with music and is trying to find a sound that is completely genre-less. I love that. Yeah, we have quite eclectic tastes. Getintothis: Thanks for that. Lastly, tell us something we don’t know. FC: “[Pause] There’s [redacted] tracks on the album. That’s actually a really big secret, so don’t tell anyone that”. Previous ArticleArt Brut Interview: Eddie Argos on Gangs, Germany and Top Of The Pops.